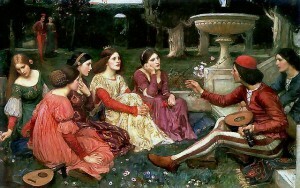 Boccaccio’s Il Decamerone (ca. 1351) is a frame story written during the bubonic plague in medieval Florence. To escape the plague-ridden streets of Florence, seven young women and three young men depart for a villa in the countryside, where they hide away for two weeks. On ten of these days, each tells a story: ten storytellers for ten nights, equalling one hundred stories. These critical and satirical stories paint a lively and transparent picture of humanity in a transitional state. Often referred to as a “Human Comedy” to replace Dante’s Divine Comedy, Il Decamerone heralded a new, humanist era in Western Europe.